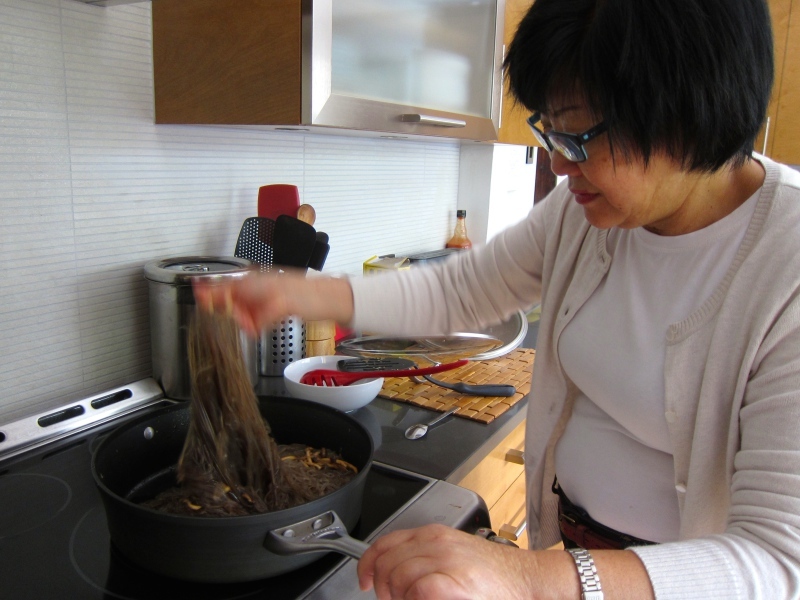 Meet Cathy Li, my new esteemed home cooking teacher. In a medium-sized bowl, combine ingredients in the order listed, mixing after each one. Cook the beef last in the leftover sauce from the noodles. In a large pan, heat oil over medium-high, then add garlic and ginger. 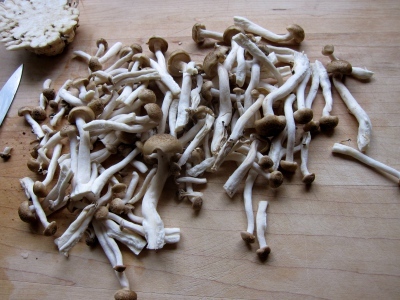 Stir for 1 minute, then add shiitake mushrooms. Stir for 1 minute, then add carrots and stir. Add 1/4 cup of water, cover and cook 2 minutes. Stir, add a little more water if needed and cook another minute or until the carrots soften a little. 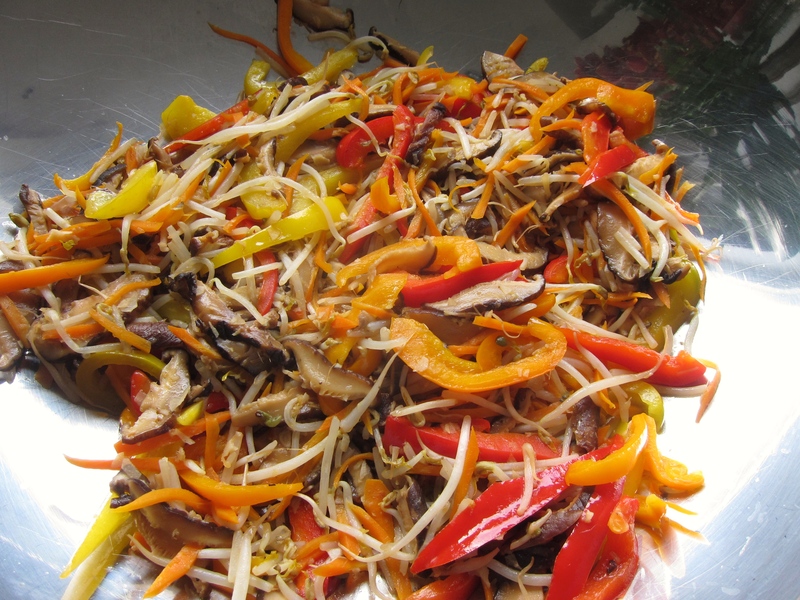 Stir in shimeji mushrooms and coloured peppers, cooking for 2-3 minutes. Add bean sprouts, stirring until wilted, then add seasoning, salt, sugar and oyster sauce. 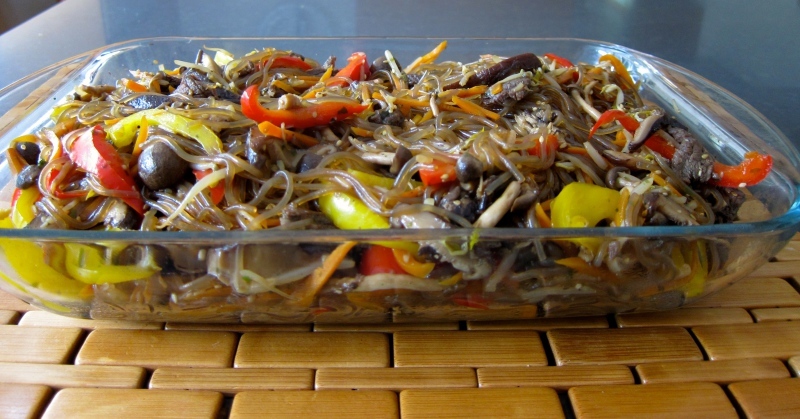 Place vegetables in a large flat casserole, reserving cooking liquid in a cup. In the same large pan used to cook the vegetables, heat the soy sauce, sugar and pepper. Add water and sesame oil. 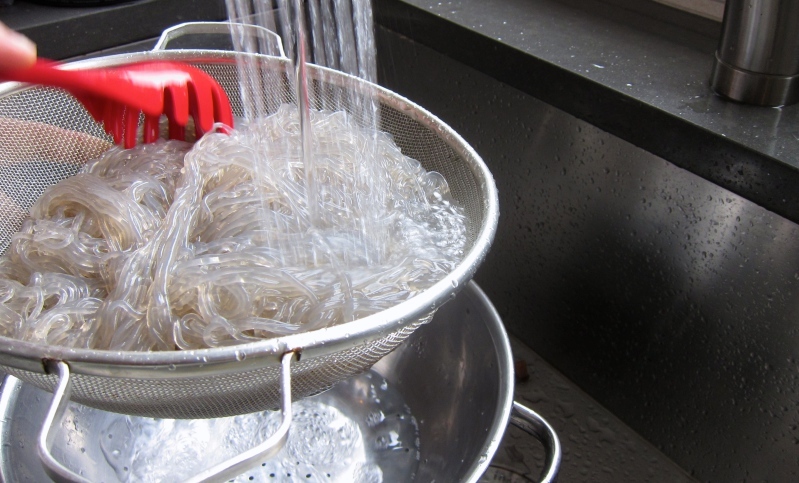 As it comes to a boil, remove it from the heat and mix in the cold noodles. Toss well and combine with the vegetables, leaving any extra cooking sauce in the pan to stir fry the beef. Garnish with rice seasoning, sesame seeds and beef. In the same pan, heat the remaining sauce from the noodles and cook the beef over medium heat, stirring for several minutes until medium rare – not too pink. Add cooking liquid from vegetables if too dry. Give the whole dish a stir and serve immediately or the next day. Excellent served warm, hot or cold. Serves 8 as a main or 16 as a side dish. When is the last time you took someone under your wing to teach her how to make a fantastic recipe? It’s a priceless gift. Do you know 10 things that are absolutely free in Seoul? 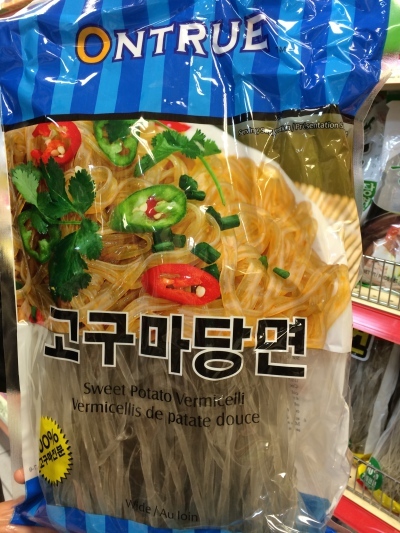 Want to know the best Korean food restaurants in Montreal? 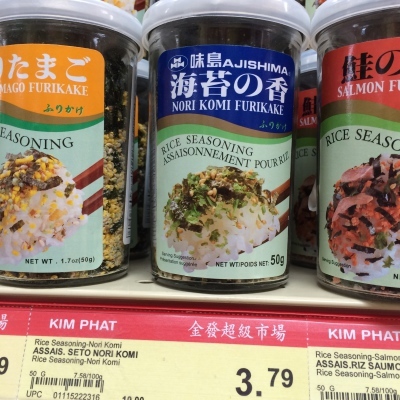 Here’s a recipe to make your own Nori Komi Furikake Rice Seasoning. 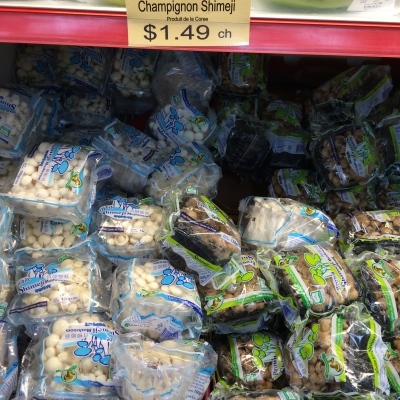 It’s also available at Kim Phat or Amazon. My kids are big fans. 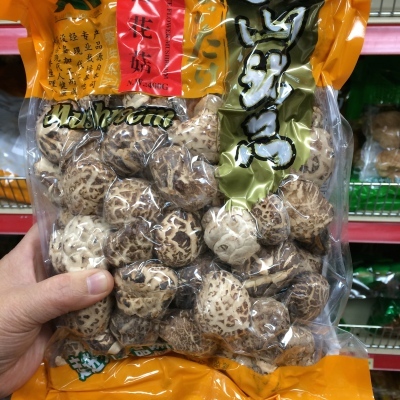 Shimeji mushrooms come all attached, but separate easily once you slice off the bottom. 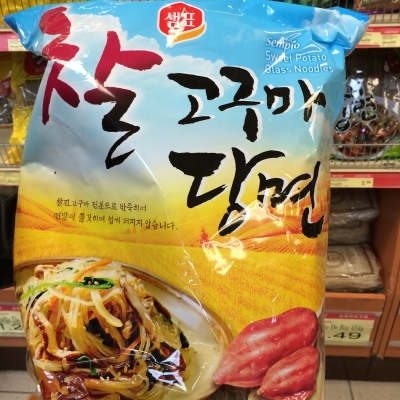 Check out this guide to buying Asian noodles. Thank you Cathy and Joanne Li for a wonderful learning, tasting and sharing experience. Keep posted for details on a Hotluck Party. Just checking if this comments thingy is broken. Test. Test.